Orgzit CRM is a platform where you can deliver top-notch services to your customers’ needs systematically. Custom Operations Management Software enables users to maintain a centralized data repository to ensure that employees have access to resources and onboarding of new staff can be optimized. With this solution, users can record reports in real-time to augment efficiency in resource planning, and complete projects within the designated scope, budget and on time. Custom Operation Management tracks the log time spent on each task or deliverable to make accurate notes with respect to the logged in time for each project. Getting an overview of the number of hours worked, milestones, etc. is a piece of cake with this solution. Orgzit is not your average task management tool. This solution organizes, collaborates and analyses features making it one-of-a-kind tool to automate business processes to devise a more beneficial business strategy. With Orgzit, the user can white-label mobile apps for their business too. Orgzit’s main aim is to brings team members together on a single platform so that everyone in the team stays on the same page and there is no room for errors. You can add team members as well as external members such as clients, vendors and freelancers. Orgzit also provides Apps that are specially designed to organize data for its users to gain useful insights about work. Orgzit CRM solution allows you to get your sales processes organized, get more business & most importantly delight your customers with timely & improved services. 360? Customer Relationship Management. Deliver Top-Notch Services. Eliminate Repetitive Tasks. Simplified & On The Go Lead Management. Capture all online and off-line leads & related details, auto-assign them to the right salesperson in your team.Flexible contact management. Monitor your leads’ history and drive more conversions by knowing which prospects to follow up, and when to call-in or send a note. 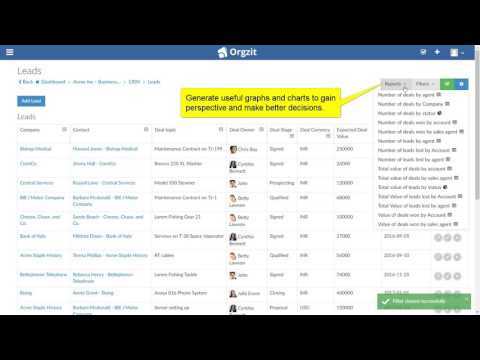 Capture each website visitor as a lead directly in Orgzit CRM & reduce the back-office manual grunt work. Capture and categorize leads according to regions, check which region is getting most leads, and double down your budget on that region. Data driven rule based lead prioritization (Hot, Warm, Cold), know which leads to pursue at what time. Give controlled access to your team members (admin, edit, view) and ensure only those who need it have access to that data. Schedule and manage appointments with customers and prospects; assign tasks to your team, collect quick notes, and keep files exchanged in one place. Streamline your quotation & order processing by eliminating manual bottlenecks, preventing errors and establishing a smooth flow from sales quote to order fulfillment ensuring timely invoicing and payment. Generate custom professional quotations right from within the CRM system. Enable your teams to sell more on the go by having centralized digital product catalog for all your product line. With just a couple of clicks convert won leads into orders and enable smooth handover of won leads to delivery teams. Keep track of product inventory, enable sales people to see product inventory before committing on delivery schedule. Maintain optimal inventory and generate POs right from within CRM for products and raw materials. Capturing leads is one thing, closing a deal is another. Let Orgzit transform your sales pipeline into a smart engine helping you organize and close deals faster. Promote accountability and transparency in your team with Orgzit CRM. Get mobile notifications anytime a new lead, deal or task is assigned to you. Also, get reminders about upcoming meetings. Integrate Orgzit CRM with your favorite telephony service for a fully functional call center software, record and track query and complaint calls. Set reminders and follow-up tasks for sales reps around important events, like when a customer needs to be sent the invoice for the month. Want complete customer satisfaction? Update client through different stages of his query/complaint through SMS. You can also bulk SMS your clients and wish them on festivals & other occasions. Schedule a meeting on click of a button, track meeting minutes & all client interactions and let the whole team know about your meeting with a quick message. 100 cold calls everyday, how many did convert? Your sales team works hard to complete their sales targets, but are you analyzing if the process they followed is the best out there? Drill down into hard sales numbers, and monitor the sales rep performances with reports that push you & your team to follow industry best sales practices. Create custom widgets for sales dashboard. Choose from a variety of tables, charts, bar graphs to create reports and absorb information quickly for the day. Drag & drop leads to change status. Visual sales pipeline report. Actionable follow-ups & reminders. Understand your business processes better by evaluating sales activities over a timeline i.e. weekly, monthly, quarterly, and yearly periods. Wherever you go, take work with you! Use Orgzit mobile app for closing deals anywhere, anytime. Create custom reports & dashboards. Evaluate and reward your sales reps based on the deals closed, emails sent, appointments scheduled and tasks completed. Manage sales ROI. Set sales targets, manage expenses and reimbursements and personalized dashboards to provide real-time feedback to sale team. Create and manage sales targets for each of your sales reps from a centralized dashboard and track their performance in real-time. Create reports based on time taken to close deals. Optimize your sales process and improve your reps’ performance. Travel Expenses? Client Meetings? Enable your sales team to submit receipts via Orgzit app and process them in Orgzit itself. Provide real-time analytics through personalized dashboards to align your sales team and enable them to deliver to their potential. Maintain centralized knowledge repository to ensure access to resources and optimize onboarding of new staff. Save money and 2x your business revenue by integrating Orgzit CRM with other business tools. Orgzit helps you sync data from your favorite apps, so you get the best of every tool under one roof. If you need a powerful yet highly configurable CRM system, Orgzit CRM has all the tools to make glove fitting solution for your teams. Triple your team productivity with orgzit workflows. Integrate Orgzit with your company’s slack account to get lead status updates, conversations, and setup a process for anything else you like. Find Your Sales Team and Customers – wherever they are. See your team and customers on a map. Are you a data-driven community of users? Have security concerns? Host Orgzit on dedicated private cloud servers & enjoy complete privacy. Don’t trust the cloud enough? Call us and we will enter into an on-premise deployment contract. Capture, convert and manage your leads. Manage projects and assign work order tasks after winning deals. Get more secure authorization with role based views. Q. What are the extra features that come with the paid plans? Our plans are designed to support the way teams work together. All our features are open to everyone including companies that are on the Simple Beginings plan. Q. Do I have to sign a fixed term contract? No, you have the option of paying monthly or annually. If you pay monthly your credit card will be billed each month. If you pay annually your credit card will be charged every 12 months. Q. Is my data safe and backed up?